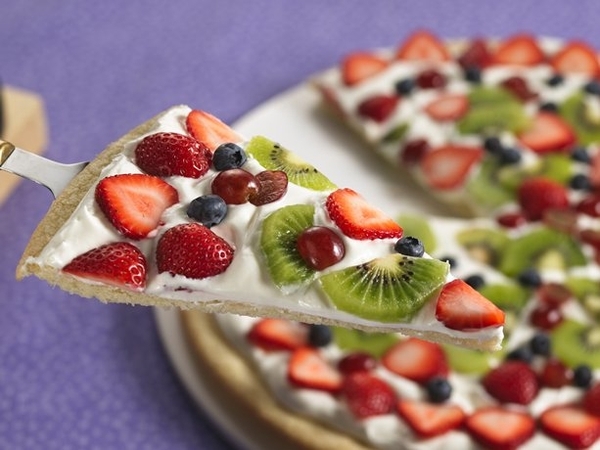 Spring Fruit Pizza! - I Am Proud Of My Kids! Nothing says Spring like fresh fruit! Better yet, fresh fruit atop some whipped cream and frost… yummy. Here is an innovative dessert recipe from bettycrocker.com, a perfect treat for picnic day with the kids and the family. Prep and cook time should round out to about an hour and twenty minute, but the result is more than worth it! Check out the ingredients and cooking directions below. 2In medium bowl, stir cookie mix, melted butter and egg until soft dough forms. Press dough in bottom of pan. Bake 10 to 15 minutes or until light golden brown. Cool completely, about 45 minutes. What would your choices of fresh food be? Also, share with us your favorite recipe and we may feature it here on our blog! 1 Comment on "Spring Fruit Pizza!"